Reading Joy’s story on Petfinder seemed like a sign to Sherri Maddick. She was still reeling with grief over the death of her beloved Border Collie, Bailey, and now her heart felt an ache over the dog she saw on her computer monitor. The dog had been dropped over the fence at the local animal control impoundment with a litter of puppies and then taken in by Indian Summers Border Collie Rescue in Minerva, Ohio. “I’d told Bailey to give us six months and then to send a sign,” she says. This seemed to be it. Unfortunately, we were in Florida for the winter, and Joy was the rescue in Ohio. Recently, Sherri wrote a book called Letters to Each Other. 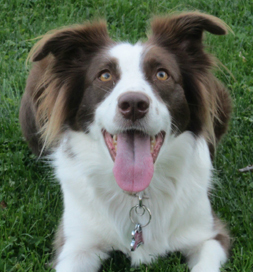 “It’s about Bailey, my first Petfinder Border Collie who told me to look for Joy,” she says. Sherri continues to volunteer to do all the media work for the rescue group and is on the board of directors, too. She not only adopted a dog, she adopted Indian Summers Border Collie Rescue as well.